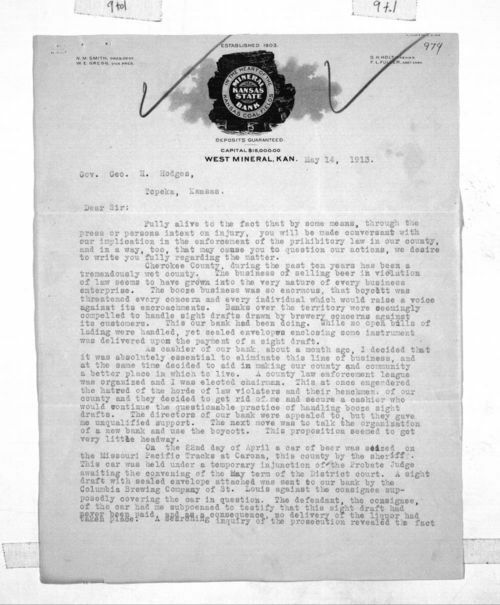 The cashier of the Kansas State Mineral Bank in West Mineral (Cherokee County), D. H. Holt, writes Governor George Hodges of Topeka, Kansas, to inform him of his bank's stand against the illegal trade in liquor. Mr. Holt claims the liquor trade so dominates the county that banks are compelled to participate by accepting drafts (an order in writing to pay money) from Brewery Companies drawn against their customer's intent to pay. The cashier describes his successful effort to stop this practice at his bank. The letter also describes the seizure of a railroad car containing beer and subsequent investigations. This letter comes shortly after passage of the Webb-Kenyon Act by Congress early in 1913. The act gave states the right to regulate or prohibit the importation of liquor across their boundaries. Shortly thereafter, the Kansas legislature passed the Mahin bill which made the provisions of the Webb bill effective in Kansas. Kansas first adopted a constitutional amendment on prohibition in 1881 and by 1909 had outlawed the sale of liquor for medicinal purposes.